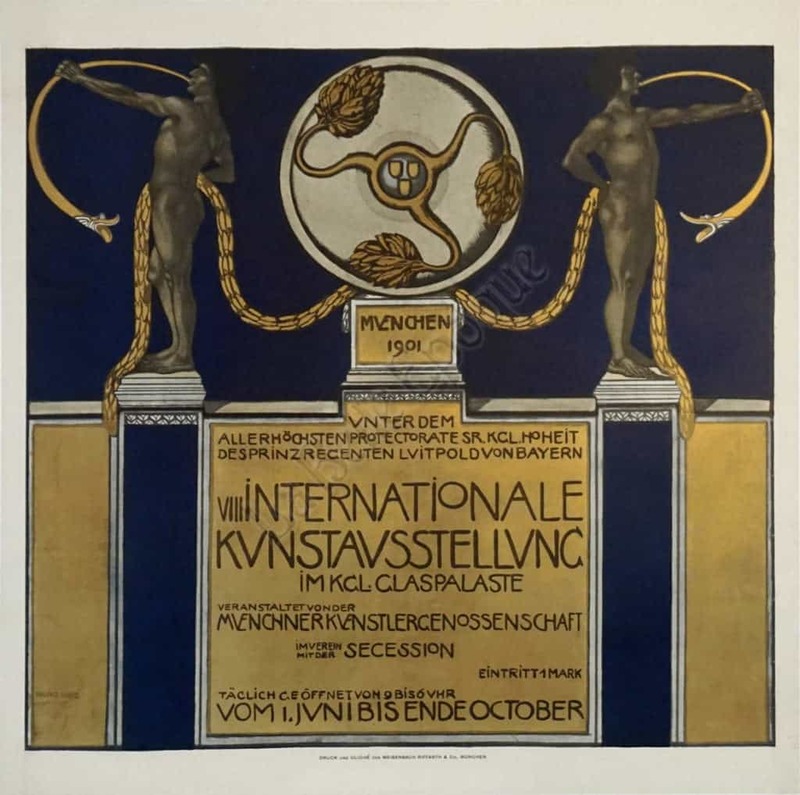 This is a rare and exquisitely made Vienna Secession period exhibition poster for Internationale Kunstausstellung by Julius Diez, 1901. The poster announces an International Art Exhibition, in October 1901, Munich, and gives various details about the exhibition. This very early work is a wonderful example of Diez’s interpretations of Classical Greek motifs. Deep navy blue and bright gold-leaf are the main colors that compose this image, the interplay of straight columns and gold fluid lines creates a visually exciting Secession period poster. Along with being a poster artist, Diez was a classically trained painter and a furniture designer. Interestingly enough, this poster exclusively features real gold-leaf instead of simply gold-colored paint. At the turn of the century, gold had a fixed, inexpensive price and therefore it was more economically efficient to use real gold than to make gold-colored paint. This original lithographic poster printed by Meisenbach Riffarth & Co., Munich, 1901.